Our former landlord and wife took us to dinner this evening to celebrate the end of our tenancy. The car park outside the Turkish House in Al Khuwayr exceeded its capacity forcing us to squeeze into a space in one of the side roads. 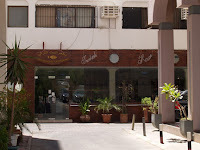 The restaurant is located in two separate parts – one facing the main road which was full of rather dismal looking diners; the other tucked down a side road was bursting at the seams with customers from every nationality. We found a table in the corner where we took stabs in the dark with the unfamiliar Turkish menu. The waiters brought salad starters accompanied by huge freshly-cooked breads which flopped over the ends of their baskets. Our main courses comprised mostly of chicken, although judging by the huge amount of food being served to the table behind, we should have tried the lobster and fish. A popular, cheap and unpretentious restaurant with excellent excellent service. Damn good – a place to take visitors perhaps.